CAPANA Mission Statement: The Cincinnati Area PeriAnesthesia Nurses Association’s mission is to advance and promote the unique specialty of perianesthesia nursing through professional education, the exchange of knowledge, research and standards of practice. Community Service Update: At CAPANA 2019 Workshop March 16th we collected cans and packages of soups, that was donated to the Matthew 25 Ministries of Cincinnati, for humanitarian/catastrophic relief. Members at the Workshop March 17, 2018 requested Dr. Shantz Slides on the Surgical Home and we have attached the presentation. Thanks Dr Shantz for sharing. CAPANA May 16 Dinner Meeting Ed. Program, Awards, and Installation at Eddie Merlot's with dinner and program provided by Barb Howell from Merck: "Clinical Considerations in Neuromuscular Blockade Management" with Speaker Dr. Laura Clark from Louisville. 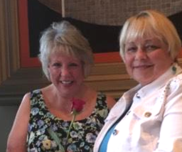 Board Members and Officers Installed for CAPANA 2018-2019 include L-R: Missy Dennis Scholarship, Debby Niehaus Treasurer, Sharon Gallagher, Past President/Nominating, Stephanie Long Secretary, Diane Thompson President and Mary Lou Rigdon Membership chair. Top row pictures: Installation of Officers Diane, Sharon, Debby and Stefanie. 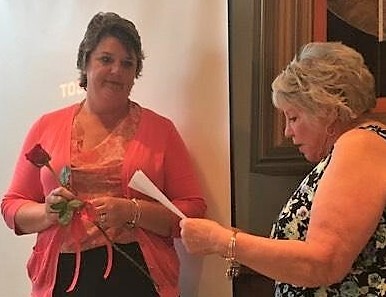 Second row a BIG thank you to outgoing Treasurer Sue Tiemeier, to Certified CAPA Kim Vossler received her pin and ribbon and Shirley Raymond presented a check/ framed certificate from OPANA as "Recruiter of the Year"- recruited 3 new members. Carolyn Hoenicke of TriHealth and CAPANA Member won 1st place for her Research Poster at the ASPAN 37th National Conference a very prestigeon honor. The poster title is" How Does Your Perioperative Leadership Fit Into Your Organizational"s Episode of Care Model Plan. This is part of the "Perioperative Home" that Dr Schantz spoke on in March and whose slides are attached as follows on this page. CONGRATS Carolyn!!! 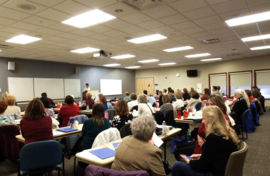 Cincinnati Area PeriAnesthesia Nurses Association had their Spring Workshop and the "40th Year" Anniversary Celebration Luncheon on Saturday, March 9, 2019 at Bethesda North Hospital Golder Room. 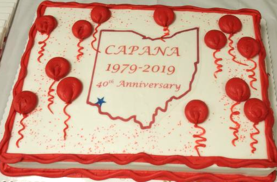 A recap of the history of CAPANA 1979-2019 by Debby Niehaus along with President Diane Thompson recognized 21 Past Presidents in attendance. 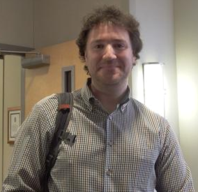 Members at Workshop March 9th requested Dr. Avner Dagan slides "Multimodal Analgesia and Chronic Pain". and Julie Sheedy's slides on "Perioperative Surgical Home Model"
Thank you both speakers for sharing. ​Flyer Download is Below. Share with co-workers! Row 1, L to R: Sharon Gallagher, Susan Patton, Marty Stahl, Donna Seaman, Debby Niehaus, Sharon Theobald, Shirley Raymond. Row 2: Cindy Zink, Janet Campbell, Martha Clark, Jane Booth, Mary Meister, Alicia Humphrey, Chris Stone, Deb Quallen, Ellen Alexander, Teri Morehouse, Sue Geary, Mary Lou Rigdon. Row 3: Diane Thompson, Barb Berling. Each President received a rose.